Once again Volkshotel will transform into one big stage where bright, new theater makers go wild. 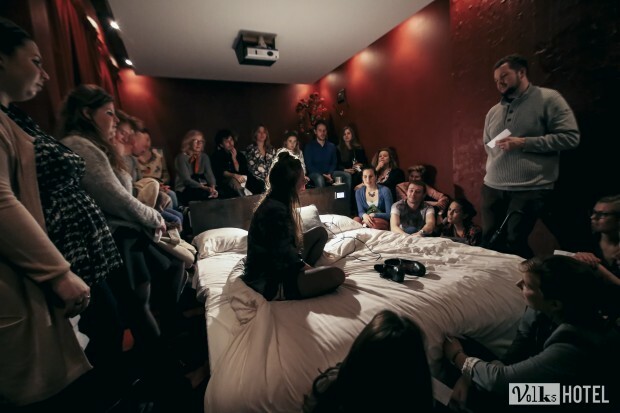 The annual ‘location theater festival for curious minds’ Secret Rooms will take you to the places where young creative people are secretly creating magic. Discover theatrical music, musical theater, dance and cabaret in unexpected locations. Find out what’s happening behind the doors you’d normally never open. Expect a festival where you might bump into a little band in the elevator, join a theater-genius in an intimate hotel room or get lost in the smokey basement. Follow a lively group of makers right up onto the roof or explore the conference halls and hidden areas all across the hotel. There’s live music, performance art, mime and spoken word besides theater, so just go on an adventure and find out what’s happening behind the doors you’d normally never open! If you get hungry there are cool drinks and tasty meals available to keep you going, catered by Werkplaats. Tickets are between €7,50 and €12,50 per show, some performances are free of charge.